Two pastors missing for more than two weeks. 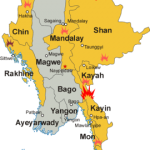 YANGON, Burma (Morning Star News) – Villagers in Shan state, Burma (Myanmar) are increasingly concerned over indications that two pastors in Burma have been killed. Sources told Morning Star News that the Burma army arrested Kachin Baptist Church pastors Dom Dawng Nawng and La Jaw Gam Hseng (not Catholic assistant priests as previously reported) on Dec. 24 after the two clergymen helped journalists report on a bombed Catholic church building in Mong Ko. They were arrested after they went to the Byuha Gon military base to secure the release of a married couple who had complained to the Burma army about the destruction of their house, sources who requested anonymity said. Military officials were said to be upset that the clergymen had assisted reporters from Yangon-based news organizations who traveled to war-torn Mong Ko, where Burma forces reportedly bombed the St. Francis Xavier Catholic Church building on Nov. 23-24. The two men were said to have taken journalists to visit a damaged school and a house in Mong Ko, along with the bombed church building. As the Burma army normally questions and quickly releases arrested civilians, the failure of the clergymen to re-appear after more than two weeks is one indication that they have been killed, sources said, adding that military officials at the base have been known to kill those they have arrested who are not soon released and burn the bodies. In addition, they said, the Burma army customarily responds to negative media reports with propaganda, but military officials have remained silent about the pastors even after widespread local media coverage of their disappearance. When media reported on the Burma jet bombing of the church building, for example, the state-run newspaper promptly published counter-reporting asserting that the army had rebuilt the damaged structure. The state-run newspaper, The Global New Light of Myanmar, has not published stories in response to reports of the missing pastors, the sources said. A journalist who traveled with the two men while covering the conflict strongly suspects they have been killed. Reliable sources told the reporter that if the pastors were still alive, media coverage of their disappearance would have prompted their release by now. In several other cases of civilians arrested by the Burma military, they are either still missing or were later found dead, the journalist said. “It is almost certain that they got killed,” the reporter said, adding that no evidence is likely to surface as civilians are not allowed on the military base, and area people are afraid to speak about any knowledge of the cases they might have. Two corpses have been found in a septic tank in Mong Ko, and officials from the Kachin Baptist Convention said they suspect the bodies are those of the missing clergymen, Yangon-based newspaper recently The Irrawaddy reported. An investigation is underway. Local administrative authorities are under pressure not to speak publically about the clergymen’s disappearance and the bombed church building, sources said, and Burma army troops are searching for anyone who may have spoken to journalists. Under pressure from army officials, the Mong Ko administrator has asked journalists not to publish photos of the damaged church building and has requested they delete published online photos, sources said. There have been no further reports on the two bodies found in the septic tank, they said. Both relatives and colleagues of the pastors filed missing person reports to police in Mong Ko on Thursday (Jan. 5). Fighting between Burma armed force and ethnic separatist organizations broke out in the area in November, forcing over 50,000 refugees to flee to northern Shan state and the China border area. The Burma army officials reportedly said they took control of Mong Ko in December and urged displaced residents to return home.